The server currently uses a unique map rotation feature that will swap between maps based on player map preferences, these being located in your character setup page. The game is weighed to use Boxstation as the default station but will, depending on player preferences and how long the current round has lasted, have a higher chance to use another map. The current, and next selected, map information are located in the 'Status' tab. These maps are currently in rotation, and can be selected and played on. 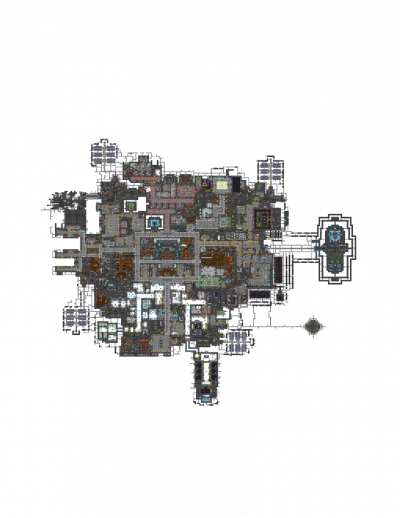 The map has been used consistently on /tg/station since 2010. The station is heavily central on the starboard wing -- all the action happens there. There are several small crevices to perform distasteful acts. Maintenance is designed to provide an outer shell to most of the station. All locations information on this wiki is sourced from Box station. MetaStation is a fully-functioning map available on the /tg/ codebase as an alternative to BoxStation. It is currently available on both Sibyl and Basil, if players vote it in using the map-vote system. It was previously the default map on the /tg/ servers Badger and later Basil, and various edited versions have run on NoxStation, /vg/, and Paradise Station. MetaStation ran on Basil for a long time and has been tested extensively, being generally well received. It is largely maintained and updated by Metacide, though it uses the work of many others, and has been worked on by various other people who have updated and maintained the map over its history. It is geared towards higher populations than BoxStation. Feedback is welcome in this thread on the tgstation forums. The map plays best with 20-40 players. The Lawyer job has been removed. The Chaplain and Curator get an entire space monastery. PubbyStation is the only in-rotation map that still uses the Singularity/Tesla Engine. This map is best suited for 50+ players. An expansive maintenance is included with this station, largely recognized as a 'second station' with a number of areas, tools, items and machines. The Supermatter is located in Atmospherics. This map is best suited for up to 20 players. Heads of staff are limited to one Captain, one Head of Personnel, and one AI. Jobs such as medical doctors and engineers have their available slots reduced to accommodate the smaller station size. The map's feedback thread can be found here. These maps either aid in maintaining the game or will be added in the future. All doors bear no access. Has a simple engine room. Has two large testing areas. 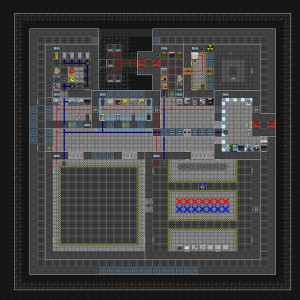 Spawns with fully equipped medical/RnD/engineering areas and a rudimentary atmos setup (no scrubbers). Roundstart mice spawns and space/lavaland ruins can be disabled in config. This page was last edited on 1 July 2018, at 15:39.